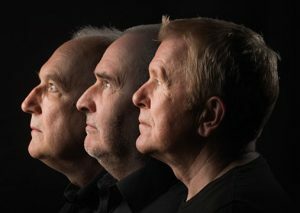 On Saturday 25th August, Coope Boyes & Simpson will sing together again in “Peace to the World”, the final event of the commemorations of the centenary of the First War in Ieper, Belgium. “Peace to the World” is a free, twelve hour event which will take place in the Grote Markt (Main Square) of Ieper. Curated by the renowned actor, director and musician Wim Opbrouck, it brings together singers, musicians, poets and writers in performances looking forward to peace, hope and reconciliation. It features some of the best – and best-known singers and musicians in Belgium playing together in unique combinations with Wim Opbrouck’s We Shall Overcome band, as well as sets from international artists.